British number two Jamie Baker won a place in the main draw at the Australian Open with victory over American Donald Young. Baker, 26, joined fellow Scot Andy Murray as Britain's representatives in the men's singles, with a 6-4 1-6 6-3 win in the final round of qualifying. James Ward missed out, however, the Londoner going down 6-3 7-5 to Germany's Julian Reister. 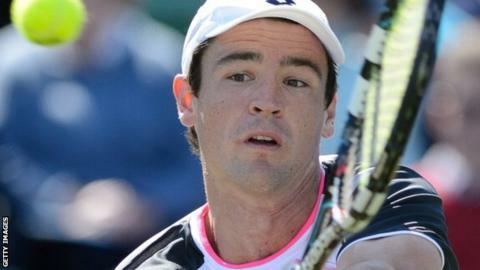 Baker will play Czech Lukas Rosol, who beat Rafael Nadal at Wimbledon. "It's huge," he said. "These Grand Slams are so competitive now; there are so many very good players and you really have to play three very good matches." Baker is ranked 246 in the world but has been as high as 186, with injury and illness repeatedly hindering his progress. In 2008, he developed a blood condition - idiopathic thrombocytopenic purpura - that saw him spend three days in intensive care in Florida. He admitted after his win over Young that he is "not a massively confident person" and has suffered with bouts of depression. "For a couple of years, particularly after I had the freak illness, I was carrying baggage like I was hard done by," said Baker. "I was really on a roll at the time and I'd been bit deprived of the opportunity that I created for myself. "There was a distinct moment where I stopped feeling that after about two years." Baker has benefited over the last two years from joining Murray - a good friend who was quick to congratulate Baker after his win - on his pre-season training camp in Florida. "This year I had three-and-a-half weeks there and it's massive amount of time to improve," he said. "It's nice to see what that length of time with a top-class player can do." Baker will play Rosol on Tuesday.